Serve this appetizer favorite elegantly in a martini glass to give it a festive look for your New Year's celebration. 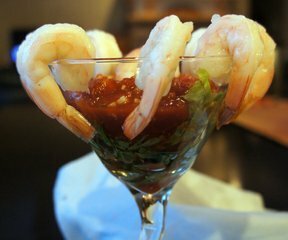 Everyone will love the little touch of heat that this homemade Bloody Mary cocktail sauce provides to this shrimp cocktail appetizer. It is bound to add some spark to your party. See how to make your bacon wrapped appetizers even better! See how easy it is to make your own homemade eggnog with these easy step-by-step instructions.